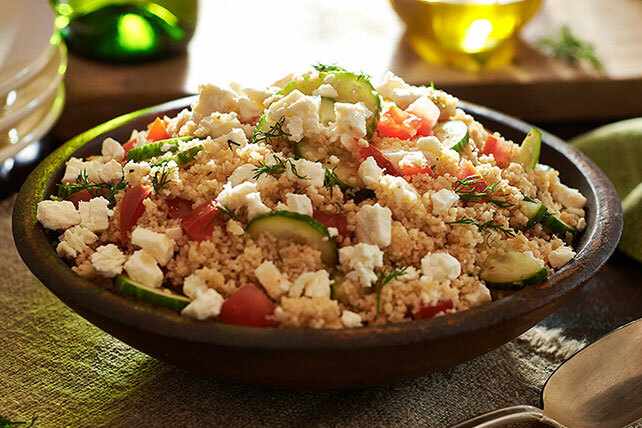 Go Greek with this simple couscous salad recipe. The Greek-Style Couscous Salad Recipe is easy to make. Serve chilled and prepare for couscous kudos. Cook couscous as directed on package, omitting salt and butter. Fluff with fork. Place in large bowl; cool 10 min. Substitute fresh mint for the dill. Substitute 4 cups cooked bulgur wheat for the cooked couscous.